It is hard for me to fully express just how beautiful our “Indian Summer” has been this Fall. You shouldn’t be surprised by my proclamation, however, as it is often the case in lovely Cape May. They say a photo is worth a thousand words, so before I dive into an in depth description, just take a look to the right and see for yourself. Nothing says “Indian Summer” better than this vision of full, healthy, summer flowers (New Guinea Impatiens) nestled around big vibrant chrysanthemums with the sun shining brilliantly through the largely leafless trees. I have to share with you that as I write this I hear guests taking beach chairs down to enjoy the glorious weather on the beach. I can’t really say how much longer this will last this year, but you still have time to experience it for yourself. 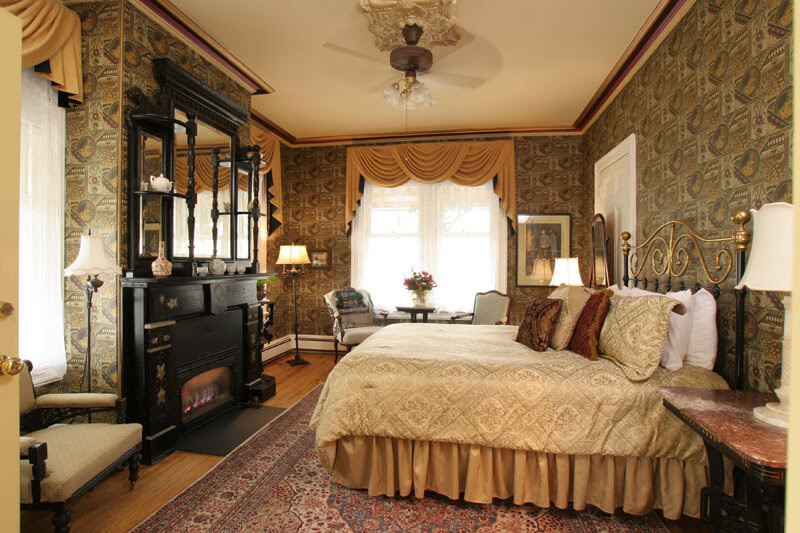 Osborne has always been one of our most popular rooms. My personal theory for that is that the decor tends toward the masculine rather than the feminine side of the spectrum (perhaps the ladies are humoring their husbands a bit so they’ll bring them to Cape May). The decor is certainly rich and elegant at the same time. Whatever the reason, Osborne is a lovely, comfortable room located on the first floor of our Queen’s Cottage building. As you can see, there is a cozy fireplace at the foot of the queen sized bed (which now has a beautiful new headboard not pictured here). What you can’t see is the incredible new bathroom that we installed a couple of years ago with its 2-person air jet tub with an integrated 2-person/2 head shower. As a real bonus, Osborne also has a dedicated parking space, which everybody loves. Being one of our most popular rooms, it is also one that is usually booked well in advance, so be sure to plan your stay in Osborne early. For years we offered a fantastic discount package we called the “222”, which was a 2 night mid-week stay (Sun – Thurs) in a standard room for $222. We didn’t want to discontinue the package, but we felt that we had to update the price a little bit after all these years. After serious consideration, we decided upon a modest $6/night increase, which yields a somewhat catchy title of “234” (2 mid-week nights in a standard room for $234). The only downside to our new name is that it makes the math harder for extending the reservation beyond 2 nights. No longer is a three night stay simply $333, or a four night stay $444. Thankfully, we all have a calculator next to our phones here at The Queen Victoria, so we’ll be able to figure the discount for longer stays for you. I’m pleased to announce that we are once again offering our “Winter Escape” discount package in 2018. This offer is for ANY 2 nights in a Large Standard room for $325. This is a great option for those seeking a great discount for a weekend stay at The Queen Victoria. The Winter Escape package also includes a complimentary cheese tray and wine tasting. Both of these packages can be upgraded to larger rooms at similar savings. ** Fine Print ** We cannot accept any 3rd party gift certificates (bedandbreakfast.com, Select Registry, etc.) or discount coupons for reservations booked with these discount packages. Select Registry $100 loyalty vouchers CAN be used. These discounts are not available for holiday evenings and weekends. With all of its old buildings & big old trees, it is no wonder that Cape May feels like the perfect place to experience Halloween. Halloween isn’t exactly a Victorian thing, but even MAC (the Mid Atlantic Center for the Arts & Humanities) gets into the spirit of the season with lots of Halloween themed activities for you to enjoy. If you’re looking for an excuse to spend a fun weekend in the next week or so, you’d be hard pressed to do better than a visit to Cape May to experience Halloween in the oldest seaside resort in the United States. We still have a few rooms left for this weekend, so give us a call at (609) 884-8702 or reserve your room online now. Twice each year CapeMay.com sponsors a wonderful “Restaurant” event. In the Spring it is a week long event called “Restaurant Week”. In November, it is paired back a little bit to become “Restaurant Weekend”. Short or long, it is definitely an experience that I HIGHLY recommend. I’m guessing you already know that some of Cape May’s amazing restaurants are a little bit pricey. 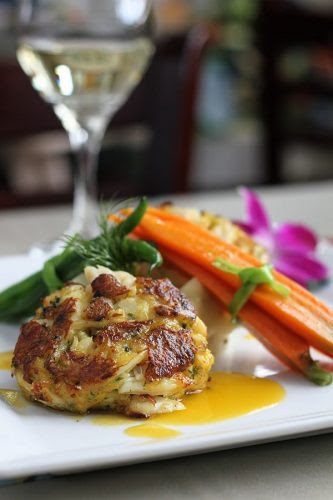 Restaurant Week(end) affords you the opportunity to enjoy a wonderful 3-course meal at Cape May’s finest dining establishments for an amazingly reasonable $35! That is a serious value when you consider that a single entree is often that much.